Besides the levels of the variable (indicator) the two most widely used measures for comparisons are growth rate and static difference between two or more units. However, at the same level of generality there exist two companion generic statistical measures S-time- distance and S-time-step as a special category of time distances defined by the level of the variable. The first measures the distance (proximity) in time between the points in time when the two series compared reach a specified level of the indicator X; the second is an additional measure of dynamics measuring time that was needed to reach the next level of X. The time distance approach brings about two persuasive advantages for extensive practical use. Expressed in time units it is intuitively understood by policymakers, professionals, managers, media and the general public, facilitating their subjective perception about their position in this additional dimension. Another technical and presentation advantage is that time and time distance is comparable across variables, fields of concern, and units of comparison. This makes it an excellent analytical, presentation and communication tool. This innovation opens the possibility for simultaneous two-dimensional comparisons of time series data in two specified dimensions: vertically (standard measures of static difference) as well as horizontally (Sicherl time distance), providing a new dimension of analysis to a variety of problems. The following examples do not deal here with the calculation of time distances but focus only on the examples how the visualisation of the time distance results can complement the visualisation of other statistical measures like static indexes to provide a broader understanding in the dynamic context. Empirically, the degree of disparity may be very different in static terms and in time distance, which leads to new conclusions and semantics important for policy considerations. Therefore, we need both dimensions, especially when we compare indicators across different domains. The few examples here show the visualisation of time matrix transformation of the usual time series database (i.e. time when a specified level of the variable was achieved in each compared unit), followed by examples for S-time-distance and S-time-step for life expectancy over OECD countries. 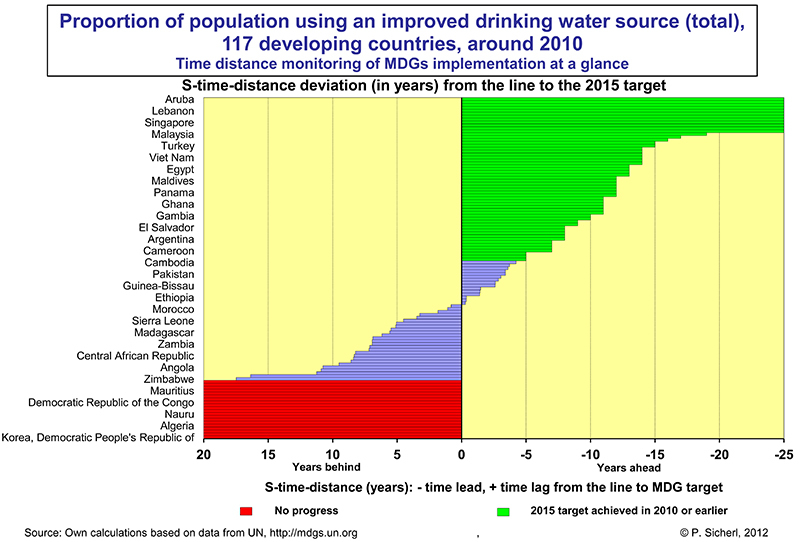 Visualisation with the help of selected types of time distance graphs (or S-time-distance and S-time-step tables as well) can be included in publications or in the respective web pages of statistical offices, international and national organisations, NGOs, by media to enhance knowledge and understanding. Seeing with new eyes and telling new stories can facilitate stakeholders to build their perceptions and decisions. Faster application of this complementary methodology by potential imaginative users in numerous fields can be helped by developing of the necessary software. The full text includes both schematic tables for transformation of conventional time series tables into corresponding time distance companions and the respective empirical examples.